Jaguar replaced XK model in 2013 with F-Type, but if you consider it as a regular replacement, you couldn’t be more wrong. Yes, XK had two doors, V8 engines, and horsepower that even went as high as 550 in XKR-S model. But it was still pure grand tourer, elegant, classy, luxurious, fast on highways but not so in love with harsh cornering or any type of rough driving behavior. F-Type came as the clear opposite. Brutal, wild, untamed and always sideways whenever you dare to relax your right foot. It was more muscle car than the majority of the American offer in that segment. But as time passed British tried to make it more reasonable, as lap times are not so glorious if your tail is constantly going its own way, so R and SVR models went AWD. That was the first sign of rational reasoning from the British Isles and now comes the second. 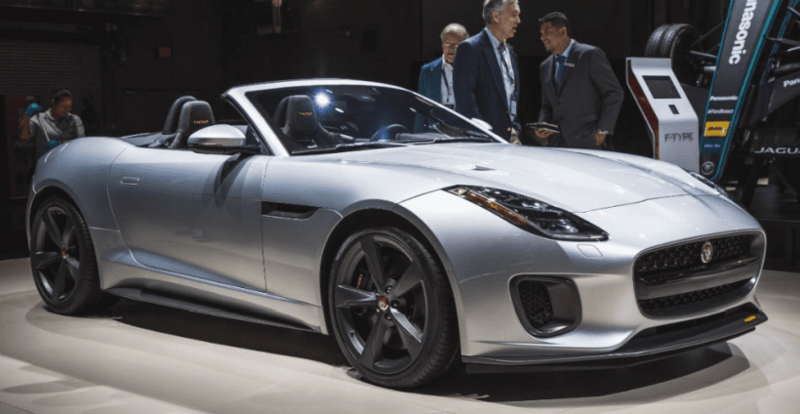 2018 Jaguar F-Type could be yours with a four-cylinder engine. Before you go insane, remember what powers latest Cayman and Boxter? Four-cylinder engine, right? So, F-Type joined downsizing game by offering 2.0-liter twin-scroll turbocharged I4 equipped with variable valve timing technology. It is the same Ingenium engine found in Evoque and Velar, but in the case of Jag, it delivers 296 hp and 295 lb-ft of torque, which is around 50 hp more. Also to make it easier for you to digest this, predecessor or XK with 3.5-liter V8 made 40 hp less, while its 4.2-liter V8 was rated at the same amount of horsepower. The new engine is paired with 8-speed automatic, but since manual is offered with V6, it should find its way here also, probably soon. Smaller engine means less weight, in this case, 114 pounds less, which is one of the reasons why it takes only 5.4 seconds or just one tenth more to 60 mph compared to V6. As for the price, the new entry-level model starts with $59k tag which is not that much lower from $61,400 in the case of base V6, so it is definitely not making this Jag especially more affordable. We honestly think that one tenth more to 60 mph is not that much big of a deal, but other things are. V6 sounds better than I4, it is prettier to look at, if you ever raise the bonnet and lift its plastic cover, the supercharger is always at work, and for the end, it gives you better bragging rights. So, you can still go with 3.0-liter supercharged V6 rated at 340 hp or 380 hp in the case of R-Dynamic model. As “crème de la crème” you have 5.0-liter supercharged V8 with 550 hp under the bonnet of R model or 575 hp with SVR model. 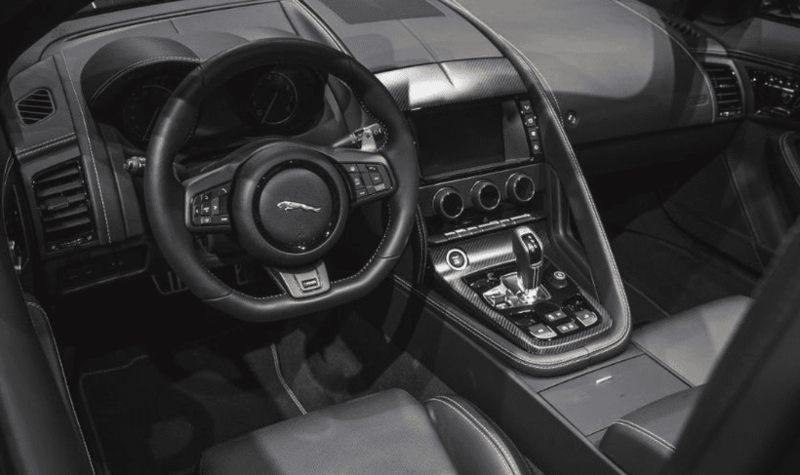 Beside new engine, 2018 Jaguar F-Type received a mid-life refresh. We have new LED headlights, and very strangely, less aggressive front bumper with round side intakes diluting its menacing appearance set by previous sharp and double slot ones. That would be one more sign, besides the introduction of AWD and four-cylinder engine, that British felt going too much with the initial recipe. Nothing changed on the inside visually, but 8-inch touch screen became standard equipment and seats are slimmer saving 17 pounds. One more novelty would be traffic sign recognition system cooperating with adaptive cruise control adjusting the speed with limits set by traffic signs. And that would be it from Brits, for now.